This is a simple mehndi design occasionally used to draw for parties or casually. Ayesha Akram got a good hand and she had a variety and quality in her work. She has beautifully drawn this floral design. 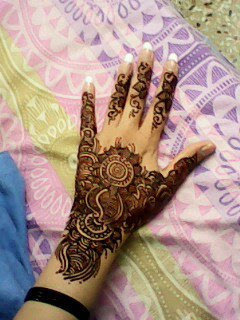 This is an Indian mehndi design covering palm and wrist and looking marvelous.